You have always been a separate motive—made up from time. One must be able to plunge into the energy motives as they are without adding to them from their own. Your wings are there. This does not mean one is to be a slave of energy, very much on the contrary. The energy is there for you, but you must be ready to take it. You will be ready when you know how to breathe and listen. Follow what you understand. Do not allow yourself to get in the way of your own understanding. It cannot be stressed enough. One of the most striking things to see in the world is that every day it becomes even more important to mind one’s own business. And I have had some remarkable experiences, on which I won’t expand, but that is very, very important. The crucifixion is but one example of what will happen if you step to the fore. The beast will jump on you and you will be dead, or put in prison until you die. This is what is happening today as well. is there anything you don't fear Nat? Yes there is something he fears , actually, he fears a lot. Within every sector of human endeavor it is imperative not to involve beyond the borders of your project. Sign all the papers and go. Do what you want, yes, only don’t start doing anything that is not obvious to the established authority of your sector. It is the organizing principle that the hierarchy must approve of the particular concern. In the grand scheme of things, what does that mean, one concern of an individual entity? How does it translate into the whole? Where lie the interests? Who can support in what way and is there a price tag? He's already the walking dead and doesn't even know it. is there something that you don't understand about FREE will Nat... you have a choice... you can or may DEPEND on the hierarchy ... or not. Each individual must know them self to be free of all forms of external reliance. This is the experiment of transformation verses evolution. Evolution is the arduous and ongoing process of shifting positions within the hierarchy -- always assessing your present position in relation to a new one that beckons you. Transformation is simply the recognition that there are accelerated pathways that bypass the hierarchy leading to sovereign mastership rather than interdependent saviorship, and that these new pathways can be accessed through direct experience of the equality tone-vibration that is present within all entities. Universe relationship through gratitude, observance of Source in all things, and the nurturance of life. The application of these life-principles in a specific equation of conduct de-couples an entity from the controlling elements of the hierarchy. How can the hierarchy act in the role of an interpretive center of truth without manipulating entities, and thus, obscuring their free will? The Grand Experiment was designed with free will as its primary method of obtaining authentic information that can be used to expand Source Reality to all dimensions of existence. Free will is the thread of authenticity that imbues value in the various tests within the Grand Experiment. The hierarchy or any other external structure never jeopardizes free will. Only the entity can choose their reality, and this is the fundamental principle of free will. That is why, Nat, the Principals are found in the FIRST Philo ... because freeing yourself from the Hierarchy is the First step in the transformation ... and believe it or not, you DO have a choice. What I want to say is, the whole situation is the true laboratory. No objective experiment can be isolated from the situation the participant or researcher is in. Much more than that, to the experiment, they are its First Point. They, in the sense, they are one entity that is in a specific situation partaking in an experiment, but their situation is their formful identity and true state of being. I realize of course that all circumstances remain indescribably complex, but our first point is to be exclusively concerned with the objectivity of our approach. So what I’m really saying is that it is wrong of science to try to isolate the experiment as much as possible, and from that perspective simplify the conditions and so on. It is not the condition of the experiment that must be simplified. It is the condition of the participant or observer. First and foremost. It is their condition. The experiment must be, on the contrary, as complete as possible in a purposeful relationship to what is already understood. where we receive life like a gift and release it like a present. this is why the WMMs are here now ... to offer you the opportunity to re-establish your WHOLEness... to UNfragment your consciousness... and if you sincerely wanted a wholeness perspective you would transform yourself NOW. anything else that you have to offer is MOTE ... and a personal BS of a fragmented being that choses to dwell in the saviorship model of existence. What they are doing now is merely statistics. They collect data on one variable or very few variables and calculate enormous psychological conclusions as to track the motion of the masses. And they don’t even realize anymore how that is subjective because it is the way everybody thinks. So that is what they are stimulating. And call this science. I’m not inventing all this. This is our actual situation in the 21st century. It’s not some elusive new thing they will discover next that will bring great change, it is a transformation at the basis of thought and language. One has to be able to observe from total emptiness, nothing must be there. Then everything is very simple. The question is, who is really concerned with the future of humanity? Who is truly serious about science and education? Who can deal with the facts? Who is ready to explore together within what is actual? Who is prepared to confront these realities we are all in? Who will do it? Will it be you? that once held me like a tree a leaf? finally frowns in deep furrows of ancient skin? lay down in the arms of angels. to the stillness of waiting stars. so near this ocean of sand? Listen for me when I'm gone. that were formed with lips mindful of you. You who will outlast me. Who linger in the courage I could not find. They are the lasting image. Last edited by Nathan on Sat May 22, 2010 10:23 am, edited 2 times in total. Lyricus is able to track and monitor SECUs (Sovereign Entities of the Central Universe) no matter what physical structures they inhabit. When we judge a particular SECU is properly prepared, they (their Wholeness Navigator) are transported to one of our training centers, which is unlike any you can conceive of on Earth. I use the words “Training Center” only because I can think of nothing else to describe them. Candidates are not necessarily spiritually minded, nor are they exemplars of humanity in terms of their personality, physical body, or temperament. They are, however, advanced SECUs operating in human form, typically unconscious of their mission and purpose. These fortunate entities are escorted from their human instrument and guided to the Tributary Zone that is best suited for their purpose and mission. They are generally taught in the form of a dialogue – not unlike the Lyricus discourses depict. They are allowed to query masters, and the masters are allowed to elucidate on relevant topics. It will come as no surprise that Einstein was one such SECU that was attended by Lyricus masters. He was allowed to formulate “his” theories through a dialogue with a single master. When he returned to his human instrument the experience and knowledge was lodged in his higher mind and a trigger was then required to draw it into consciousness. These triggers are carefully orchestrated event strings that the master in charge of the SECU coordinates through a process we call – again, I’m translating as best I can – lucid re-orientation. This process requires that the information gained, while at the Tributary Zone, filters into the consciousness in a re-collectable state. In order for this to occur, Dr. Einstein would experience an event or EDSS (Encoded Data Sensory Stream) that induces or triggers a recollection of a seed memory. The seed memory is the most critical part of the lucid re-orientation process because it alone carries sufficient power to draw the new knowledge into the conscious state of the human mind. I have grossly simplified this process, and words are very vexing limitations to describe this. I had better stop here before I completely confuse you. Track the individual, yes, but science is tracking the masses, that's all I am saying, and that you don't get it is not my illusion. ok...it is your perspective...how you choose to view Life ... your personal preference that you have created as YOUR reality ... no one else has YOUR perspective or YOUR reality ... but that doesn't separate you from Source Reality ... which is the way things ARE - WHOLE - you do that. "The starting point for Bohm's articulation of what he means by a "new order in physics" is his notion of wholeness. 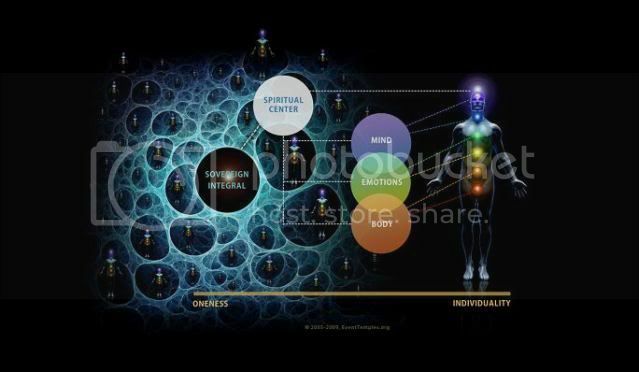 Thus crucial for understanding the holomovement is his notion of how interconnected phenomena are woven together in an underlying unified fabric of physical law. In the following section, called "Law in the Holomovement", he takes up the question of order, and the laws of organization which relate the parts to each other and to the whole. This is what he calls the "law of the whole", or holonomy. Rather than starting with the parts and explaining the whole in terms of the parts, Bohm's point of view is just the opposite: he starts with a notion of undivided wholeness and derives the parts as abstractions from the whole. The essential point is that the implicate order and the holomovement imply a way of looking at reality not merely in terms of external interactions between things, but in terms of the internal (enfolded) relationships among things: "The relationships constituting the fundamental law are between the enfolded structures that interweave and inter-penetrate each other, through the whole of space, rather than between the abstracted and separated forms that are manifest to the senses (and to our instruments)"
Darlene Berges walks her talk and over the years has contributed much to the WMM. Here is a wonderful example of what she has given and she acknowledges whose work is whose. This is called "The Neutral Heart". She truly cares and makes herself accessible to help others. Thank you Darlene.